5-Minute Dungeon lives up to it's name and literally takes five minutes to play. You'll be pushed to your limits as you attempt to make it out alive with this fast paced, real-time card game where players use quick thinking to combat monsters, overcome obstacles and escape dungeons. This lighthearted card game is perfect for almost any occasion and is great for up to five players that are ages eight or older. Don't be intimidated by the 15 page instruction manual - learning how to play is actually fairly easy. You'll love the quick nature of this game. Give 5-Minute Dungeon a try today! If you defeat all the Door Cards, Challenge Cards and the Baby Barbarian, you have conquered the first Dungeon - do this four times and you'll be the winner. You'll get 250 cards, 5 double-sided hero mats, 5 boss mats and the official 5-Minute Dungeon game rules and instructions. 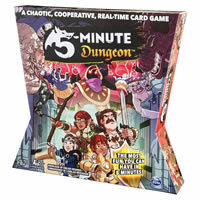 Please keep in mind that the official 5-Minute Dungeon dice-card rules and instructions could be different depending on the game version you have. The rules below are some of the exact directions on how to play 5-Minute Dungeon. Share with us your comments, funny stories, tips, advice, strategies, creative ways to play, questions about how to play, problems with the rules or anything you want about 5-Minute Dungeon. All submissions will be reviewed within 24 hours. Click here to add your 5-Minute Dungeon comments. Whenever you play a card, you draw another card. If you have 2 players and only 5 cards in each hand, how can you get enough resource cards to defeat a boss?